The heir apparent to the British throne (England, then Great Britain, then United Kingdom) is usually conferred the title of Prince of Wales. According to Britannica and Wikipedia, this tradition dates back to 1301 when King Edward I invested his son the future King Edward II. However neither explain why this title was used. Prince of Wales is an unusual title; it is not hereditary, automatic, and doesn't affect succession. It is only a tradition to grant it to the heir apparent. It also has little to do with Wales, as its title holders are neither Welsh, nor born in Wales, nor speak the language. So why was this title used? Was there something special about Wales, or the title itself? The granting of the title 'Prince of Wales' by Edward I to his son (the future Edward II) was a demonstration of his authority over Wales and a political statement to that effect. One could also argue that the king was emphasizing the importance of Wales by granting it to his heir, his own flesh and blood who would one day become King of England. The fact that Edward II was actually born in Wales maybe made it seem 'extra appropriate' to make him Prince of Wales. Retaining a title of the leader of a conquered or annexed territory and giving it to a favoured noble or to a son was not uncommon for the period. Nor was it uncommon to grant a title (especially an important one) with lands to an heir though, as in this case, it usually carried little effective power. Thus, the tradition had already been established (though not specifically for Wales). The Wikipedia article you cite mentions that Wales was ruled by princes (not just one at a time for Wales was not unified) from around the 12th century. These were known as Princeps Walliae in Latin and Tywysog Cymru in Welsh; 'twysog' means leader, 'Cymru' means Wales. However, it was not until about 1244 that a Welsh prince (Dafydd ap Llywelyn) first styled himself 'Prince of Wales'. In 1267 the treaty of Montgomery was negotiated. In this, Llywelyn’s title of Prince of Wales was acknowledged, and the other Welsh rulers (with one exception) became his tenants, owing him fealty and homage. He now had an acknowledged dominion over Powys and Deheubarth, in addition to his own Gwynedd. Most of the territorial gains he had made in the 1260s were conceded. There was a price to pay for all this. Llywelyn acknowledged that he owed fealty and homage to Henry III. In 1284 a group of Welshmen came to Edward I at Conwy and presented him with a reliquary cross, the Croes Naid, containing some of the wood of the Cross itself. The surrender of this to the English king was a symbolic, moving acknowledgement of conquest, for the cross had been the prized possession of Llywelyn ap GruVudd, prince of Wales. it was not until May 1301 that he began to be termed Prince of Wales. The young man was sent to Wales very promptly: he spent some five weeks there in April and may, receiving the homage of his Welsh tenants. The announcing of the baby Edward (the future Edward II) as 'Prince of Wales' can thus be seen as an important symbol. By making his son Prince of Wales, Edward I was effectively 'taking over' the title which had been held by Welsh leaders i.e. no need for anyone else. The granting of a title to the heir to the throne was nothing new, even if the term 'Prince of Wales' was. At the time of his birth, the young Edward was only 2nd in line, behind his brother Alphonso who was 'styled' as the Earl of Chester. Since 1301 the title [Earl of Chester] has generally been granted to heirs-apparent to the English throne, and from the late 14th century it has been given only in conjunction with that of Prince of Wales. Alfred may have followed the strategy adopted by his grandfather Egbert of strengthening his son's claim to succeed to the West Saxon throne by making him sub-king of Kent. Thus, there is clearly a precedence for giving an heir a title to a particular territory to make it known who the reigning monarch saw as the heir to his throne. The principalities of Wales was not unified under a single banner until Edward I (Edward Longshanks), King of England, executed the last native Prince of Wales, Dafydd ap Gruffydd (David III) in 1283. Edward I created the institution of Prince of Wales in 1301, at a parliament at Lincoln (not Westminster). Edward of Carnarvon (Edward II) was the first English Prince of Wales. As the conqueror, Edward I used this opportunity to deny the Welsh their right to determine the next heir-apparent, in particular, the Edling (Welsh: etifedd). As for determining their heir-apparent, the Welsh had a tradition of choosing their leader and the title Edling is likely borrowed from the Anglo-Saxon, Ætheling (also spelt Aetheling, Atheling or Etheling). In terms of Welsh tradition on inheritance, it was unique. The Welsh practiced partibility, as opposed to primogeniture (i.e. inheritance going to the eldest son). This created all kinds of in-fighting between relations after the passing of Welsh leaders and Edward's father, the less-than-exemplary Henry III used it to great effect after the passing of Llywelyn the Great in 1240. More perplexing still for English and Scottish onlookers, and far more problematic, were Welsh social attitudes, which stood in sharp opposition to their own. Take, for instance, the rules governing inheritance. In England and Scotland, and indeed almost everywhere else in western Europe, the rule was primogeniture: firstborn sons inherited estates in their entirety. This was hard on any younger brothers or sisters, but had the great advantage of keeping a family’s lands intact from one generation to the next. In Wales, by contrast, the rule was ‘partibility’: every male member of the family – not just sons and brothers, but uncles and nephews too – expected his portion of the spoils, and rules of precedence were only loosely defined. This meant that the death of a Welsh landowner was almost always followed by a violent, sometimes fratricidal struggle, as each male kinsman strove to claim the lion’s share. The result of this idiosyncratic approach to inheritance was that Welsh politics were wont to be tumultuous. The fact that partibility applied at the highest levels was one of the main reasons why there was no single political authority in Wales as there was in England and Scotland. Welsh poets spoke of their country as if it were neatly divided into three kingdoms, but this was a broad simplification; the reality was a complex patchwork of petty lordships. Occasionally one ruler might, through force of arms, diplomacy or sheer good luck, contrive to establish something greater. But such constructs were always temporary. When a successful Welsh ruler died, his work was swiftly undone by the general carve-up that inevitably followed. So, by Welsh convention, if there was no Edling, their partible inheritance system would have caused another round of division and in-fighting for leadership. It started in 1256, before Edward I started his reign in 1272 and was finally achieved nearly 30 years later, when he was King of England. 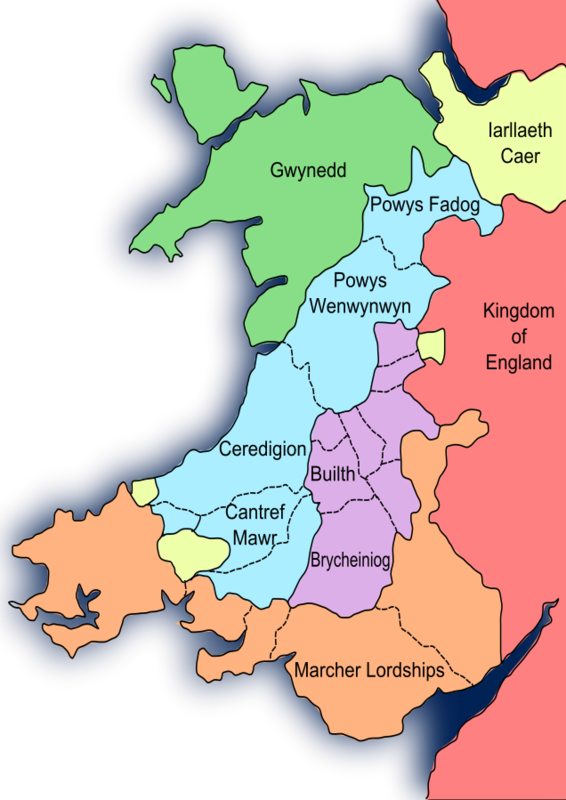 The resurgence of the Gwynedd, led by Llywelyn ap Gruffudd (Llywelyn II, grandson of Llywelyn the Great) in late 1256 was in fact caused by Edward's own visit to Wales earlier in the year, when the king's chief steward, Geoffrey de Langley, ".. boasted before the king and queen that he had all the Welsh in his grip"
The effect of this boast was a rebellion, and with help from Llywelyn ap Gruffudd, was a full-scale military incursion into English lands as well that of Marcher lords. In addition, Edward's own castles at Dyserth & Deganwy were besieged (newly built by his father, Henry III, but given to Edward as endowment for his marriage to Eleanor of Castile). This is important because it was not Henry III's fight -- most of the lands in Wales held by Henry were already bestowed to Edward. The Welsh inhabitants were finding English rule in Perfeddwlad oppressive. Geoffrey de Langley, the representative of the English king in Wales,‘boasted before the king and queen that he had all the Welsh in his grip’. The response was explosive. ‘The Welsh, coming out of their own territory, gathered a great army, headed by Llywelyn II, a handsome man and vigorous in war, who had, as it were, collected together all the Welsh to himself.’ Within a week Perfeddwlad was in Llywelyn’s hands. Over the next decade his series of military and political successes was continuous. In campaigns reminiscent of those of his grandfather, he expelled Gruffudd ap Gwenwynwyn of south Powys, raided as far south as Pembrokeshire and made a succession of conquests on the Middle March at the expense of Marchers like the Mortimers,taking Builth and Brecon. For decades after this, Edward and his father tried, but failed to subdue Llywelyn II. Henry III, as King, had to recognise Llywelyn II as Prince of Wales in 1267. Not even Llywelyn the Great achieved this feat of forcing the King of England to recognise a ruler of Gwynedd over Wales. The Peace of Montgomery between Llywelyn and the English crown, made in 1267, ceded to the prince virtually all his conquests,the title ‘prince of Wales’and the fealty and homage ‘of all the Welsh barons of Wales, so that those barons shall hold their lands in chief from the prince and his heirs’. The princely dynasty of Gwynedd was thus recognised as the sole channel linking the native Welsh chiefs and the English crown. Edward's reign then started in 1272 and he finally conquered Wales with passing of David III (younger brother of Llywelyn II and the the last native Prince of Wales) in 1283. The Duchy of Cornwall was created by royal charter in 1337 by Edward III for the Black Prince. Both Edward III and the Black Prince were excellent role-models (of the time) and this is probably why this practice became entrenched, and developed into English parliamentary convention. The role of the duchy is to provide revenue for the heir-apparent (assets are held in trust). The Duchy of Cornwall Act, 1860, organised and standardised the governance of the duchy and the holdings and perquisites are actually located beyond the modern county of Cornwall, to Devon, Somerset & Gloucestershire (closest to Wales). A recent discussion on the Rights of the Sovereign and the Duchy of Cornwall Bill, Hansard, 2013. The title of Duke of Cornwall is granted to the eldest son, but not necessarily the heir-apparent. More info available at their website. Not the answer you're looking for? Browse other questions tagged england united-kingdom titles great-britain royal-succession or ask your own question. If the heir to a Kingdom is called Crown Prince, what is the heir to a Duchy called? Why was Prince Philip given these specific titles before marrying Princess Elizabeth?